Heat oven to 350°F (325°F for dark or nonstick pans). Place paper baking cup in each of 24 regular-size muffin cups. Make and bake cake mix as directed on box for 24 cupcakes. Cool 10 minutes; remove from pan to cooling racks. Cool completely, about 30 minutes. In small bowl, mix vanilla frosting and green food color until desired shade; frost cupcakes. 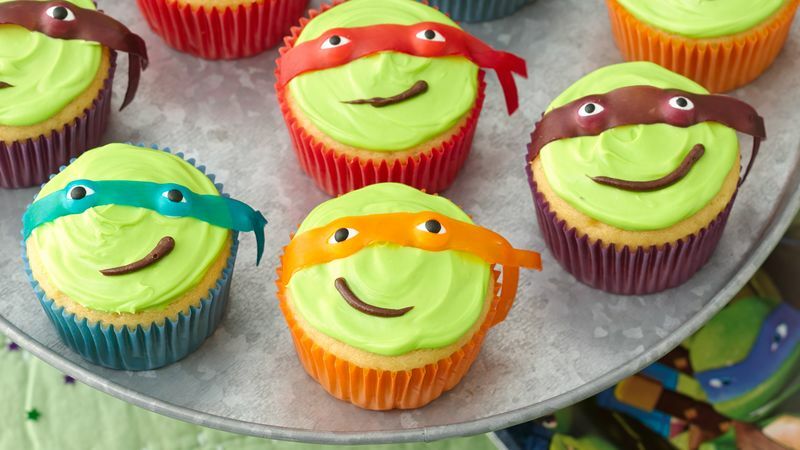 Unroll fruit snack, and cut off 4-inch strips of desired colors to make masks on cupcakes. Place cut strip on cutting board. Starting about 1 inch from left side of fruit snack, use small sharp knife to cut small horizontal slits for eyes about 1 inch apart. Place candy eyes under slits in fruit snacks. Cut small horizontal slit in fruit snack on right side to form tie for mask. Place masks on cupcakes. Use gel to make mouths on cupcakes. Or place chocolate frosting in small resealable food-storage plastic bag, and cut off small corner of sealed bag; pipe mouths on cupcakes. Bake and frost the cupcakes up to a day ahead. Make the masks with eyes the day before also. Store in sealed container to prevent them from drying out. You can use Betty Crocker™ Fruit Roll-Ups™ Hot Colors fruit flavored snack to make the masks, also. Cut strips 1/2 inch wide and 4 inches long for masks.